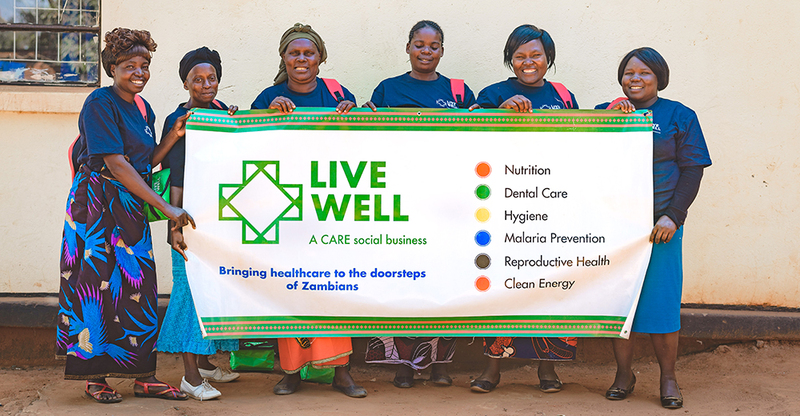 Based in Zambia, we recruit, train and support a network of Community Health Entrepreneurs (CHEs) to promote basic healthcare and to sell health-impact products into under-served communities in rural and peri-urban areas. In the 1970s, Zambia adopted a free healthcare policy for all citizens yet many Zambians continue to suffer needlessly from health conditions that are easily treatable or preventable. The Government of the Republic of Zambia (GRZ) set up a network of almost 1,600 health facilities to provide care across the country. However, the GRZ struggle to reach the entire population, particularly in far-flung rural areas. Even if Zambians manage to reach a facility, the facilities are often under-resourced and operate with only 1 or 2 doctors and nurses per 5000 people. People therefore rely heavily on volunteer, community-based health workers who lack sustainable sources of income themselves and which the GRZ faces the challenge of offering a wage. Live Well addresses a real need at household level, by raising awareness of health issues and increasing access to non-prescription health products that can be life-saving. Alongside this we are providing CHEs with entrepreneurial opportunities and a self-generated income in communities with high unemployment rates. To improve health awareness, increase availability and access to affordable health impact products by creating viable business opportunities for Community Health Entrepreneurs (CHEs) in underserved communities across Zambia. Live Well aims to establish and support a network of over 6,000 CHE’s by 2024. Improve healthcare awareness amongst communities through our network of CHEs.